The entire month of October is National Dental Hygiene Month, a month to raise awareness about the importance of dental hygiene. 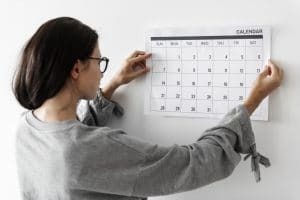 Not only is it a good time to check in with yourself about the last time you had a routine cleaning, but you can also check in with yourself about your routine at home. It is recommended that everyone get a professional dental cleaning at least twice a year, so that bacterial tartar can be removed from your teeth. October is also a great time of year to check in on your dental benefits and use them before the end of the year. Contact your dental team in Lafayette, LA to ask about your benefits or smile needs. The American Dental Association recommends everyone brushes their teeth for at least two minutes twice a day. You may hear it referred to as 2×2. Two minutes allows you enough time to adequately brush each surface of each tooth. Some electric toothbrushes come equipped with a timer to help make you stay on track. There are also phone apps that can help. Even just your regular old watch or clock can help you keep the time! Brushing for less time can leave bacteria behind in your mouth after brushing. While you are brushing your teeth, don’t forget to brush your tongue to clear away that bacterial buildup! Flossing allows for you to get any buildup between teeth where your toothbrush may not reach. This helps to keep both your teeth and gums healthy. Rinsing with a non-alcoholic mouthwash or even water can help ensure that bacteria is removed from your smile. Just swish for a bit and spit! When brushing your teeth before going to bed, be sure that mouthwash or water is the last thing in your mouth. Even cough syrup can create lingering issues if left in your smile while you sleep.